Ladies and Gents, welcome to my Double Cannonball review! MsWas posted awhile back singing the praises of the Inspector Gamache series. 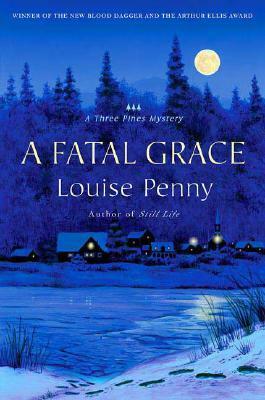 I quickly started the series and fell in love with the main characters, setting, and pace of the mystery. I like to space out series when I can, so when I discovered that the second book in the series, A Fatal Grace, is set around Christmastime I knew I would chose it as my December Audible credit (the narrator of these, Ralph Cosham, is simply a delight). Nothing like reading about the coldest, snowiest winter in Quebec while experiencing an El Nino winter that has highs in the 60s in 70s in the Northeast and high 80s in the Southeast of the United States. This novel finds Gamache traveling back to the town of Three Pines to investigate one or the odder murders he’s come across – murder by electrocution. It doesn’t seem too strange, until you realize that most accidental electrocutions have been reduced, and the possibility of actively electrocuting someone has been greatly reduced my modern life. Gamache is called in to decipher who could have committed the murder, at a frozen lake during a curling match, of possibly the most hated woman in town. What I really loved about this book, aside from the intricacies of the investigation of CC de Poitiers murder, was the natural expansion of the universe of the novel. We learn more about some favorite Three Pines residents including the Morrows, Gabriel and Olivier, Myrna Landers, and Ruth Zardo. We are also introduced to some additional residents and get more information on the case that has stalled Inspector Gamache’s career and those who remain loyal to him. Penny is working to create a ever increasingly complex world which is only a good sign as this series is expecting its twelfth installment in the new year. As to the mystery, this one was a bit simpler to piece together than the Still Life’s but sufficiently complicated to hold my interest throughout. Expect a review of book number three, The Cruelest Month this spring, since I’m enjoying reading the Gamache books along with the seasons they are supposed to be taking place in. I think this will likely be my last review for CBR7, since I’m not planning on getting any reviewing done while on vacation through the New Year, but I’m looking forward to CBR8 and book club! This entry was posted in Cannonball and tagged double cannonball, inspector gamache, murder mystery.